Canare's foil shielded Multichannel Audio Snake Cable is perfect for all general-purpose studio applications. 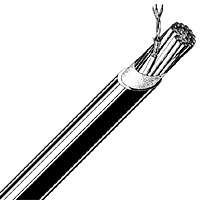 Each individually isolated channel consists of 2 twisted conductors under an easy-strip PVC jacket over a foil shield and drain wire. Plus each channel is color-coded eliminatingthe need for shrink tubing. Perfect for control room layout and interfacing between equipment racks, audio patchbays, mixers and tape decks. Canare MR202-AT - 25 AWG Stranded Copper Conductors -twisted pair cable. Nominal overall Outside Diameter (O.D. ): .433 in.